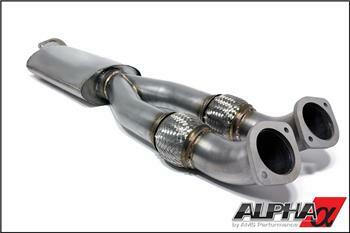 Alpha Performance Midpipe NISSAN - Dezod Motorsports Inc - Home of the automotive performance enthusiast since 2002. The Alpha Performance Midpipe / Y-Pipe is one of the largest available on the market. Using a large 90mm (3.5”) primary pipe we were able to optimize exhaust gas flow. Most systems implement two 76mm (3”) pipes that Y into a 76mm primary pipe causing turbulence and unnecessary backpressure. By making our primary pipe 90mm we are able to greatly improve exhaust flow, freeing up horsepower and improving spool time. With unrivaled fit, finish and performance the Alpha Performance Midpipe / Y-Pipe will easily support any future modifications.